The grammatical structure is like that of the Polish, but the accent is varied. The following examples will show some of the grammatical features: Masculine noun declined: nom. sing, tzar, (a, the) czar or king; gen. tzarya; dat. tzaryu; acc. tzarya; voc. tzar; instrumental, tzarem; indicative, tzarye; pl. : tzari, tzarei, tzaryam, tzarei, tzari, tzarya-mi, tzaryakh. The indicative is always used with a preposition, of, on, or the like: o tzarye, of the czar; na tzaryahh, on the czars. Feminine noun, sing. : ruka, hand, ruki, rukye, ruku, ruka, rukoyu, rukye; pl. ruki, ruk, rukam, ruki, ruki, rukami, rukakh. Neuter noun, sing. : zerkalo, looking glass, zerkala, zerkalu, zerkalo, zerkalo, zerkalom, zerkalye; pl. : zerkala, zerkal, zerkalam, zerkala, zerkala, zerkalami, zerkalakh. Adjective masc. sing. : mudry, wise, mudravo, mudromu, mudravo, mudry, mudrym, mudrom; pl. : mudryye, mudrykh, mudrym (mudrykh), mudryye, mudrymi, mudrykh. The personal pronouns are the following: ya, I; ty, thou; on, he; ona, she; ono, it; my, we; vy, ye; oni, onye, they. The first 10 numerals (masc.) are: odin, dva, tri, tchetyre, piat, shest, sem, osem or vosem, deviat, desiat. The perfect of the verb bit, to be, is - sing. : ya byl, I have been, ty byl, on byl, ona byla, ono bylo; pl. : my byli, vy byli, oni and onye byli. How far the language is susceptible of assimilating foreign words, especially German and French, can be seen from a few examples: general, heneral; civilization, tzivilizatzia; department, departament; ministry, ministerstvo; poetry, poezia; prose, pro-zn; theatre, drama, tragedy, comedy, teater, drama, trahedia, comedia, and so on. Among the best grammars of the Russian language for the use of foreigners are those in German by Heym, Vater, Schmidt, Tappe, Oldekop, Boltz (2d ed., 1854), Joël (1860), and Booch-Arkossy (1864), and in French by Langen (1825) and Reiff (2d ed., 1859). Among the best dictionaries are those of Hevm, Russisch-deutsches und deutsch-russisches Wörterbuch (Riga, 1795-'8; Russian, German, and French ed., Leipsic, 1844); Tatishtcheff, Nouveau dictionnaire fran-çais-russe (2 vols., Moscow, 1832); Oldekop, Russisch-deutsches und deutsch-russisches Wörterbuch (last ed., St. Petersburg, 1843); and Makaroff's French-Russian and Russian-French dictionaries (St. Petersburg, 1868). There is an English-Russian grammar and dictionary by Constantinoff (3 vols. 8vo, London). - The first germs of literary life in Russia appear in the time of the introduction of Christianity by Vladimir the Great (about 990). The Slavic translation of the Bible and the introduction of Old Slavic liturgical books by Cyril and Methodius led to the general adoption of the Old Slavic as the written language, while the common Russian language began to form itself from the various dialects of the mixed population. No monuments whatever are left to show the condition and growth of the Russian language at this early stage; even the popular songs which elucidate the beginning of many other literatures have reached us only intermixed with later alterations. In the Old Slavic language we have the treaties of the princes Oleg and Igor with the Greeks of the years 911 and 944, and an address of Sviatoslav; but whether their origin really belongs to this ancient time, or whether they are more recent translations from the Greek, is uncertain. An important Old Slavic work, Russkaya Pravda ("Russian Justice"), which was composed during the reign of Yaroslav (about 1020), was discovered in 1738 by Tatishtcheff, and published by Schlözer (St. Petersburg, 1767). Nestor, the father of Russian history, belongs to the same period (died about 1114). The rule of the Mongols over Russia interfered but little with the growth of Russian literature, for the conquerors spared the convents, in which science found a safe refuge. Among the few works of this early period which have been preserved are the "Annals" of Simon, bishop of Suzdal (died 1226), a work of the metropolitan Cyprian (died 1406), a part of the "Sophia Chronicles" from 862 to 1534 (published by Stroyeff, Moscow, 1820-'22), and a considerable number of fables and tales, mostly centring round Vladimir and his knights, and bearing great resemblance to the tales of the round table. Among the most celebrated old Russian poems is the Pesnia o polku igore-vom (on the expedition of Igor against Polotzk), written about 1200. It was discovered in 1796 by Count Mussin-Pushkin at Kiev, and has since been often published (with a German translation by Hanka, Prague, 1821). The long duration of the Mongol rule caused a number of Mongol words to be received into the Russian language, which are still in use. After the expulsion of the Tartars, Ivan III., Ivan IV., and especially Michael Romanoff, gave a new impulse to the progress of Russian literature, by establishing new schools, encouraging scholars, and calling distinguished foreigners into the empire. Among the authors of this period are the metropolitan Macarius (died about 1564), who wrote biographies of saints, Russian divines, etc, and Matvieyeff, the author of several historical works. Nikon, patriarch of Russia (died 1681), had the Bible translated into the Slavic language, and caused a revision of the Slavic liturgical books after the Greek originals, for which purpose more than 500 Greek manuscripts were collected by his order. But the great drawback to the rise of a truly national and popular literature, the use for literary purposes of another language than that of the people, was not removed until the reign of Peter the Great, under whom the intellectual condition of Russia underwent a revolution no less thorough than the material. He abolished the use of the Old Slavic as the official language of the government, and took energetic steps for superseding it as the language of literature. He fixed the alphabet of the common Russian language, superintended at Amsterdam the casting of the first types, and gave to a printer of Amsterdam, who in 1699 published the first book in the Russian Ianguage, the monopoly of printing Russian books for 15 years. The first newspaper was established in Moscow in 1704, and the first in St. Petersburg in 1705. Peter instituted the imperial academy of science according to a plan of Leibnitz; it was opened shortly after his death, by Catharine I. (1725). The impetuosity with which Peter endeavored to give to his empire a literature did not leave him time to establish it on a native basis, and to develop the national resources; the writers whom he urged on to write naturally brought many foreign and heterogeneous elements into the rising literature. An Italian theatre was opened at the Russian court in 1730, and a German one in 1738. Among the principal authors of this time were Demetrius, metropolitan of Rostov (1651-1709), who wrote biographies of the saints (4 vols., Kiev, 1711-'16); Theophan Procopovitch (1681-1736), metropolitan of Novgorod, who left about 60 theological and historical works; Basil Niki-titch Tatishtcheff (1686-1750), who wrote a history of Russia in 4 vols. ; Prince Cantemir, a satirical poet; the two Cossack poets Kli-movski and Daniloff; the historian Prince Khilkoff (died 1718), who wrote a " Summary of Russian History;" Ivan Kyriloff, a statistician and geographer; and Basil Grigorovitch, who described a journey to western Europe. Trediakovski improved Russian prosody, but his poems exhibit more learning than poetical genius. - The work begun by Peter the Great was carried on with great vigor and success by the empresses Elizabeth and Catharine II. Elizabeth, who regarded art and science as the brightest ornaments of her court, founded the university of Moscow, and the academy of arts in St. Petersburg. Catharine II. added new and immense fields to the literary production of the country, by establishing public schools throughout the empire. She also established normal schools, liberally supporting the pupils, enlarged and patronized the academy of sciences and the academy of arts, and established in 1783 the academy for the perfection of the Russian language and history. At the head of the authors of this period stands Lomonosoff (died 1765), the father of the modern Russian language. He wrote the first critical Russian grammar, was the first to write pure and genuine Russian prose, and is still valued as a lyric poet. The first dramatic writer of note was Sumarokoff (died 1777), who with almost equal success wrote also historical and other poetical works. For the exhibition of his dramas national theatres were established at St. Petersburg (1756) and Moscow (1759). Among the other distinguished poets of this time were Kheraskoff (1733-1807), one of the most prolific writers of Russia, and Bogdano-vitch, whose romantic poem Dushenka has become one of the favorites of the nation. Der-zhavin (1743-1816) exhibited a greater originality than any of the preceding poets. His lyric, didactic, and dramatic works still hold a high rank, and his "Ode to God" has been translated into nearly all civilized languages. Von-Vizin (died 1792) was particularly successful as a writer of comedies, some of which, as his Nedorosl, are still performed at the national theatres; he was also the best prose writer of this period. Kapnist as a lyric poet equalled Derzhavin in tenderness and purity of language, and was his superior in poetical genius. In dramatic poetry Kniazhnin (died 1791) is almost the peer of Sumarokoff. Count Khvostoff deserves honorable mention for his comedies, and Prince Dolgoruki (1764-1823) for his philosophical odes and epistles. Platon, metropolitan of Moscow, wrote numerous works on ecclesiastical history. A "History of Russia" was written by Shtcherbatoff (1733-'90); Boltin (1735-'92) wrote critical essays on the ancient history of Russia; Tchul-koff, a "History of Russian Commerce;" Go-likoff, "Collections for a Biography of Peter the Great;" and Pleshtcheyeff, "Statistics of Russia." Muravieff (1757-1807) wrote many pedagogical, moral, and historical essays, all of which exhibit depth and nobility of feeling, keenness of thought, and an accomplished style. Novikoff (1744-1818) founded a typographical society, and established a satirical journal which had considerable influence in literary circles. 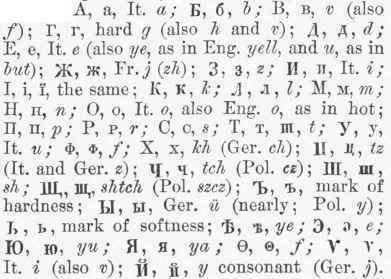 The critical study of the language was greatly promoted by a "Comparative Dictionary of the Russian Language" (St. Petersburg, 1787-'9), for which Catharine II. herself drew up the plans. - The history of Russian literature in the 19th century exhibits steady progress. Alexander I. was a liberal patron of literature; he increased the number of universities and established many new literary institutions. Under Nicholas I. Russian literature emancipated itself fully from the controlling influence of foreign elements, assumed a thoroughly national character, and received new inspiration from the rise of the Panslavic movements, both political and literary, in which Russia, as the foremost representative of the race, seemed to be required to play a prominent part. The new period beginning with the 19th century was opened in a worthy manner by Nicholas Karamsin (1765-1826), who delivered Russian prose from the dominion of bombast, and set a brilliant example of a plain, flowing, and sprightly language, especially in his chief work, a "History of Russia," in 12 vols. He seems to have taken Wieland as a model. Many of his followers even outdid him in imitating the German classics, and there was danger of Russian literature becoming Germanized, when a reaction arose through Shishkoff (1754-1841), minister of public instruction, and a distinguished poet, philologist, and translator. The old Russian and purely national tendencies found a centre in the "school of Moscow." The victory of that school is in great part due to the genius of Pushkin (1799-1837), whose poems afford a faithful and patriotic reflection of Russian life, which forms the subject of nearly all his works. He is, in particular, the founder of the national tragedy (by his "Boris Godunoff," 1831), for which he used, following the example of Zhukovski, the iambic metre, which was adopted by many, although others retained the Alexandrine verse. Zhukovski himself (1783-1852) is one of the greatest poets of Russia; he was the founder of a romantic school, and distinguished himself in almost every kind of poetry. Dmitrieff (1760 -1837) distinguished himself equally in satire, epistle, hymn, and epigram. The poets Kry-loff, Khomiakoff, and Koltzoff also belong to this period. Among the followers of Pushkin must be named Baratynski (died 1844), Delvig (1798-1831), Benedictoff, and Podolinski. One of the favorite lyric poets of modern times is Lermontoff (1814-'41), whose works have been translated into many languages. Pushkin and Lermontoff were beyond question the two most talented poets Russia has ever produced, and their works have exercised the most powerful influence on the mind of the young generation. Pushkin is the Byron of Russia, Lermontoff its Schiller. Other lyric poets of distinction are Viazemski (born 1792), a writer of elegies, and Gneditch, an excellent translator of the Iliad, "King Lear," and other foreign poems. Among the dramatic poets of distinction was Ozeroff (1770-1816), who was the first to fully comprehend the essence and objects of dramatic poetry. His tragedies ("Oedipus," "Fin-gal," etc.) are written in the Alexandrine verse; and although the language is not pure, and the structure of the verse is frequently heavy, these faults are fully outweighed by the vigor of thought and expression. Prince Shak-hovski (died 1846) and Glinka are authors of many comedies. . Among the more recent dramatic poets, Polevoi and Kukolnik, both of whom took the subjects of their dramas from Russian history, are the most important. Gogol (died 1852) in his comedies and novels pictured with great talent and intense sarcasm the provincial life of Russia. The historical novel has been cultivated with particular success by Bulgarin, who, however deficient his works may be from an aesthetical point of view, has the merit of having first ventured to portray actual life. Zagoskin, an imitator of Walter Scott, pictured the life of the lower classes, and Count Solohub that of the higher classes of St. Petersburg, Other distinguished writers in this branch of literature are Prince Odoyevski, Masalski, Senkovski, and Dahl. The idyllic life of the Cossacks was represented with great freshness and talent in the works of Gogol, Grebenka, and Kvitka, some of whom used the peculiar dialect of Little Russia (Ruthenian). Collections of popular tales and songs, to which in Russia as in all Slavic countries much attention is paid, were made by Novikoff, Maximovitch, Makaroff, and Sakharoff, and more recently by Afanasieff. Among the prominent historians are Ustrialoff, professor at St. Petersburg, whose "History of Russia" (German translation, 3 vols., Stuttgart, 1840), which urges the gradual Russification of all the non-Russian tribes of the empire, has been officially introduced as a text book into the Russian colleges; Pogodin, the author of valuable critical works on the ancient history of Russia; Polevoi ("History of Russia"); and Danilevski, the author of some able though partial works on the wars of Russia with Napoleon I. Able historical investigations have also been made by Bestuzheff-Riumin, Sniegireff, Sreznevski, the academician Solovieff, and Arsenieff. Philosophical studies are still in their infancy, and mostly lean on modern German philosophy. Scientific theology is cultivated still less. A "Cyclopaedia of Law" has been written by Nevolin, and a "History of Russian Law" by Moroshkin. As is the case with all despotic countries, Russia has a very stringent and annoying system of censorship, which has proved to be a great impediment to literature, yet at the same time a great promoter of it. All the writers of the 50 years preceding the accession of Alexander II. were turned into a kind of political martyrs. The independent study of sciences, the free culture of poetry, fiction, and the fine arts, were constantly checked, and despotism was rampant everywhere. The writers naturally strewed their pages with political allusions and recriminations, which exposed them to prosecution on the part of the government, causing their productions to be read by people who would not otherwise have taken any interest in them. In this way the progress of Russian literature since the accession of Nicholas to the throne in 1825 has been amazing. He began his reign amid a military revolution with which a few of the literary people were indirectly concerned. The leaders of the movement were hanged, and the others exiled to Siberia; but an impetus was given to liberal ideas which could not easily be checked. These ideas broke out again in 1848-'9 with Petrashevski's conspiracy. During that period Pushkin, Lermontoff, and Gogol were the leading writers, whom, moderate though they were in their views, the government never ceased to persecute. They were all exiled or banished at different times, but still went on with their liberal propaganda, embittered by the persecution and rendered immensely popular by their wonderful talents. Among those connected with the later revolutionary movements were two other young men, wealthy and well educated, Hertzen (1812-'70).and Ogareff. They managed to escape to London, established there a Russian press, and began a series of publications of which the Kolokol ("The Bell"), a political newspaper, became the most celebrated. Russian travellers smuggled it into the empire in large quantities, and its fierce attacks on the government greatly contributed to awaken a feeling of patriotism among the more enlightened of the population. The Crimean war showed even to Nicholas that his system, far from strengthening his empire, paralyzed its natural resources, and rendered worthless even the army, for which he had sacrificed everything else. When peace was concluded, and Alexander, who always had the reputation of a liberal and good-natured prince, ascended the throne, the progressive elements of the country naturally came to the front. Within less than five years after the conclusion of the peace of Paris, the party which consisted formerly of very moderate liberals, and never asked for anything beyond a reasonable amount of freedom of the press and public life, was transformed into ultra radicals. The teachings of modern materialistic philosophy, which had been rapidly gaining ground in western Europe, were eagerly adopted by the young generation of litterateurs and students, and within two or three years a school was formed, the radicalism of which outstripped anything that could be well imagined. Vogt, Moleschott, and Büchner became the theological and philosophical idols of the Russian youth; Fourier, Saint-Simon, Robert Owen, and Proudhon became their social teachers; and a system of cosmical, political, and moral conceptions was formed, which would have frightened the very writers whose authority it invoked. The disciples of this school were known as Nihilists, or believers in nothing. Its leaders were Tchernyshevski and Dobroluboff, and their organ was the Sovremennik ("The Contemporary"), a monthly magazine owned and ably edited by the poet Nekrasoff. It had speedily created a large party among the young men in the universities and public schools, and the spreading movement frightened the government, which prosecuted everybody who showed the slightest sympathy with it. All the conspiracies and political prosecutions which have taken place in Russia since 1862 have been connected with Nihilism. Among the prominent men of the party, besides Tchernyshevski, who was exiled to Siberia, and Dobroluboff, who died at the age of 26, were Pisareff (drowned by accident), Shelgunoff (exiled to Siberia), Mikhailoff (died in Siberia), Serno-Solovievitch (died in Siberia), and Pomialovski (died from overwork and excessive drinking at 23). The party is now considerably reduced. Whatever remains of it is under the leadership of Antono-vitch and Zhukovski, two journalists of indifferent talent, but of more knowledge than their predecessors possessed. Foolish and extreme as are the views of that party, it has immensely contributed to the spread of knowledge throughout Russia. The works of Buckle, Huxley, Darwin, Tyndall, John Stuart Mill, Helmholtz, Virchow, and many others have been translated and passed through several editions. Some of the medical students (who joined the movement en masse) have made themselves favorably known all over Europe through their researches in physiology and biology. The movement did not exclude women, many of whom began to study medicine and natural sciences, and took their degrees, mostly at the university of Zürich, as the doors of the Russian universities are still closed against them. Among the most celebrated of contemporary Russian authors are the romancists Ivan Tur-geneff, Gontcharoff, Dostoyevsky, Avdeyeff, Count Tolstoi, jr., Krestovski, Khvostchinski, and Panayeff; the poets Nekrasoff and Polon-ski; and the dramatists Ostrovski and Count Tolstoi, sr. Prominent among editors of newspapers and periodicals are Aksakoff, Krayefski, Stasulevitch, Korsh, and Katkoff. The historical writers occupying the highest position are Solovieff, Pypin, and Kovalevsky. For statistical work the highest reputation has been achieved by Semenoff and Korsak. The great philosophical writer is Lavroff. As a matter of course, the chief literary centres are the two capitals, St. Petersburg and Moscow. The post office of St. Petersburg sends out to the provinces more than 80,000 copies of daily and 40,-000 of weekly papers, and about 50,000 of monthly periodicals. The highest circulation of any one newspaper has not yet exceeded 25,-000, but the number of publications is constantly increasing. The growth of Russian literature with such marvellous speed has prevented its being thoroughly studied abroad, and there are very few works on the subject which bring it down to the present day. - See Gretch, Essai d'une histoire de la littérature russe (4 vols., St. Petersburg, 1819-'22); Bowring, "Specimens of Russian Poets" (London, 1821); Otto, Lehr-buch der russischen Literatur (Leipsic, 1837; translated by Cox, Oxford, 1839); Jordan, Geschichte der russischen Literatur (Leipsic, 1846); Talvi (Mrs. Robinson), "Historical View of the Languages and Literature of the Slavic Nations" (New York, 1850); Khanikoff, Études sur l'instruction publique en Russie (Paris, 1865); and Petroff, "Sketch of Russian Literature" (French translation by Ro-mald, Paris, 1872). Of late years many articles on Russian literature have appeared in German, English, and American magazines, and especially in the Paris Revue des Deux Mondes.